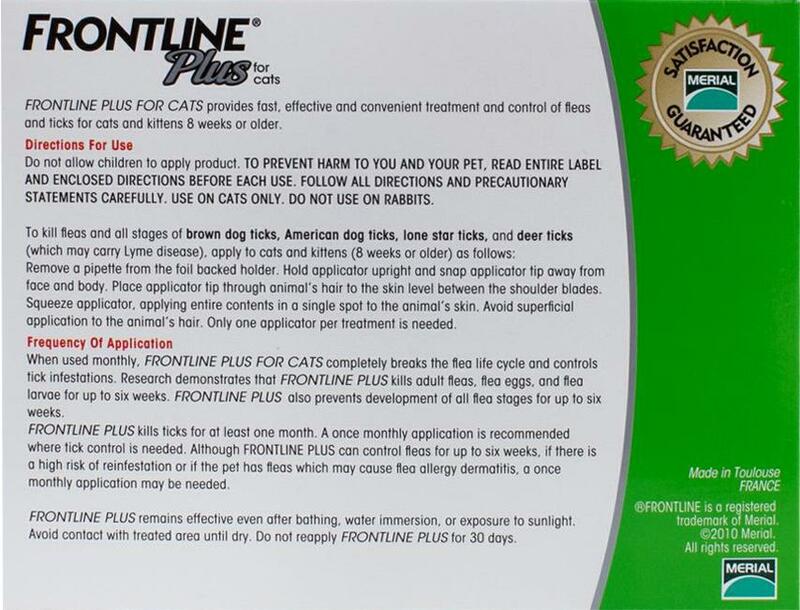 Frontline Plus for cats 8 week or older prevents fleas and ticks. Frontline Plus begins killing parasites immediately, eliminating up to 100% of fleas after 18 hours, and terminating any and all ticks after 48 hours. Make sure you protect these inquiring little rascals to the best of your ability by purchasing the very best in veterinary science. The product is Frontline Plus. It is shipped from our Sinagopore warehouse. I've been using Revolution on my cat for years without any issues. But we will be spending a month this summer in an area with a tick problem and am considering a switch to Frontline. The cat is 10 years old and weighs 20lbs. Should there be any concerns to switch over? Frontline cover tick and flea but it doesn't cover intestinal worms. You need to consider to top up Frontline with Milbemax or Profender to cover intestinal worms. Two of my cats were having flea-related skin issues. The vet recommended that I switch from the high quality brand I was using to another high quality brand to see if that would produce better results. He recommended Frontline. From the first application, the issues were resolved. This experience showed me that I needed to match my desire for quality with the compatibility of the animal. I was on a tight budget and we had a flea outbreak from a visiting dog. I ordered this for my cats and it did cut down on the fleas but did not get rid of all of them like some of the other brands. There were still fleas running around on the cats even a week after treatment. Am very pleased with the product and shipping seems to be quicker than when we first started ordering flea and tick meds in 2016. Can't beat the price and free shipping.